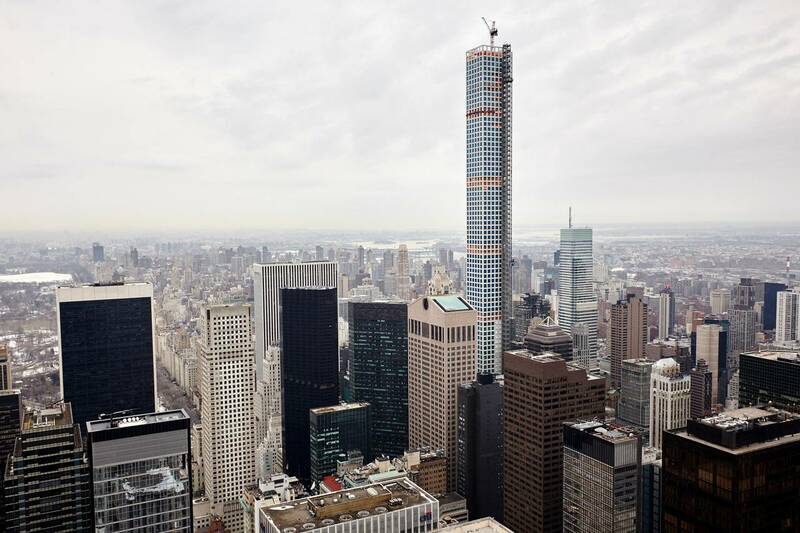 Rafael Viñoly’s 432 Park Ave., one of the tallest residential towers in the world and the third-tallest building in the U.S.
Manhattan’s skyline is making yet another historical surge upward, though this time with a new crop of super-tall, strikingly narrow apartment buildings that in some cases seem to defy gravity. To see for yourself, walk by SHoP Architects’ 111 W. 57 St., Christian de Portzamparc’s One57, Jean Nouvel’s 53 W. 53rd St. or Rafael Viñoly’s 432 Park Ave.
What’s arresting about these structures is their eccentric dimensions. SHoP’s 111 W. 57th St., for example, will boast a width-to-height ratio of 1-to-23. (A standard No. 2 pencil has about a 1-to-30 ratio, and the original World Trade Center towers were a gouty 1-to-7.) Some of these new structures, especially on the upper reaches, are only one unit per floor. These innovations mark just the latest chapter in the evolving history of the skyscraper. Over the past century, technological breakthroughs have enabled builders to steadily reduce the proportion of structural elements—mainly steel and concrete—in the area where we live, work and play, savings usually given over to glass. One result is buildings that look downright precarious, despite their tremendous strength. 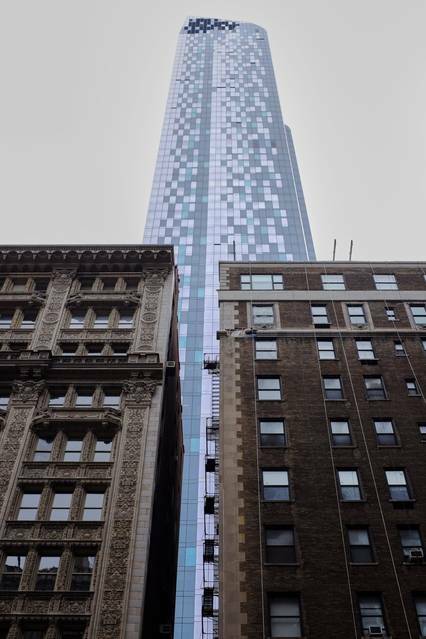 For example, the residential tower that Kohn Pedersen Fox Associates has designed for 45 E. 22nd St., now under construction, is 75 feet across at its base but 125 feet at its top. Until the late 19th century, buildings were largely supported by their masonry walls, and, with time, by iron frames that could rise only to about 10 stories. Then came steel. Skyscrapers like the Flatiron Building were able to soar so high because they were held up by frames of steel girders anchored in bedrock. In the 1930s, advances in glass fabrication liberated buildings from exterior masonry and produced the glass-curtain wall, conceived by Mies van der Rohe in 1922 and realized here in his Seagram Building and in Gordon Bunshaft’s Lever House. But residential developers remained a long way from the Holy Grail: exteriors made mostly of glass, which flood interiors with light, provide spectacular views and maximize usable floor space. The modern curtain walls of the 1950s still required thick exterior columns for support. That’s not much of a problem in commercial buildings, but a large exterior column in a living room window is about as welcome as a vagrant. Over the past three decades, structural engineers have come up with a wide range of innovations in materials and design—mainly in the realm of reinforced concrete—that enable developers to reduce the size of exterior columns and in some cases put more of what holds up a building in its core. Leo Argiris, a principal at the engineering, design and planning firm Arup, says “there was no eureka moment” in the evolution of reinforced concrete, but rather a series of steps ensuring that each material involved was of the highest quality and that they were mixed and poured on a precise schedule. Such steps have doubled the strength of reinforced concrete since the 1980s, according to Ahmad Rahimian, U.S. director of building structures for WSP, which is erecting One57. Steel is a widespread and easy frame system for commercial buildings; the intense strength of reinforced concrete, which can be wielded in narrow columns, is typically preferred for these residential buildings, freeing more exterior space for views. What’s the next pinnacle in the sky? We’re certainly capable of building even taller, narrower residential buildings, but the prime constraint, at a certain point, is how much living space would remain at the top. Some portion of the structure is inevitably devoted to elevators and the core. If a building narrows at all, as most do, the remaining floorspace dwindles to a size that could hardly be called luxurious. Another important constraint is how to transport residents to the top floors—432 Park Ave. is 96 stories. The elaborate elevator banks of commercial buildings simply occupy too much space, and fewer elevators would entail longer delays reaching upper floors. If residents haven’t grown old working to afford one of these pricey units, they just might waiting for the elevator. Elora Hardy’s groundbreaking designs are as outside the box as they come: She tries to reimagine homes, free from the shackles of tradition. For instance, why does a door have to be rectangular? Why can’t it be round? It helps that Hardy is building them out of bamboo. 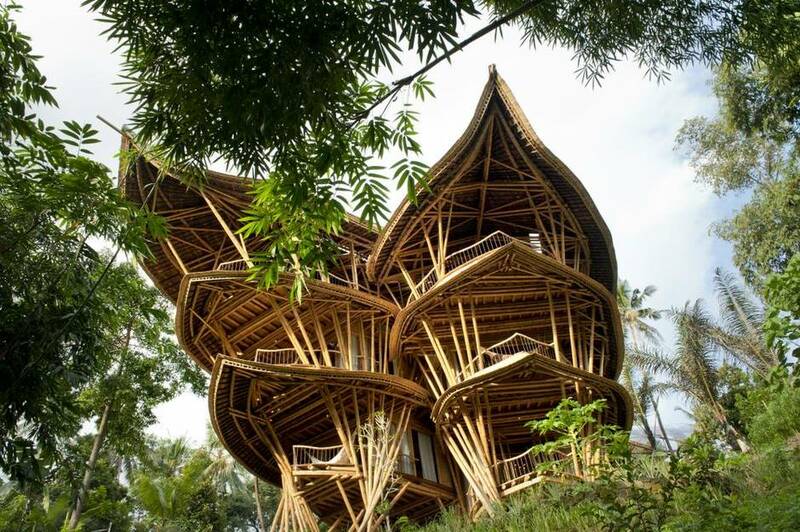 For the past five years, her startup Ibuku has built more than 50 unique bamboo structures, most of them in Bali, where she lives (in a little bamboo pod that’s “literally a big basket,” she told me; her business cards are also made of bamboo). Many are private, luxurious homes in a community known as Green Village.